This is yet another example of why real-time search was such a big deal. I only noticed how much of a big a deal it was once it was gone. It's an important night in Libya and Tripoli. We've reports that the most important battle of the war so far is being fought. This could be the last battle. I've seen Twitter reports that Gaddafi is dead. In fact, tonight is a night to think about more important things than Search and Social - but I can't help my digital DNA. 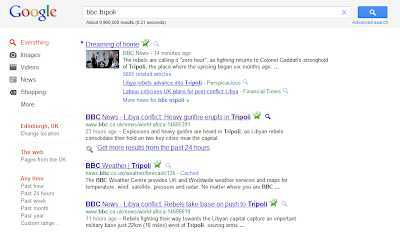 I've turned to Google to search for [bbc tripoli] and the results are interesting. There's an onebox with nearly 10,000 news results. I've never seen so many. In a few hours we may well be on the 10,000 mark. The next result is another onebox with a link to news from the past 24 hours. This is good. This is news embedding - but it's not real time. It's 23 hours old. What's next? 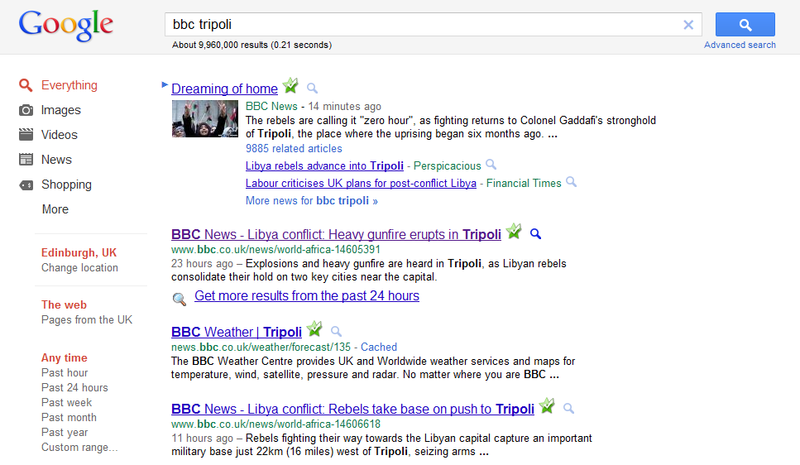 Google gives me the BBC's weather report for Tripoli. What? Really? Amazing. While real-time search was working I'd have a ticker of Twitter and other updates below those news results and I'd know what the BBC was reporting about Tripoli. Without it Google's not managed to satisify my search.